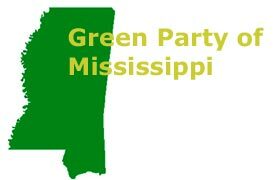 Today, the Green Party of Mississippi announces its official registration as a political party with the Secretary of State's office as of April 4, 2002 . Supporters gathered in their home towns of Jackson , Hattiesburg , Long Beach , Oxford , Tupelo , and Starkville to make the public aware of the party's new status. Preparations for a Green Party in Mississippi began two years ago when signatures were gathered to put Ralph Nader as President and Winona LaDuke as Vice President on Mississippi ’s ballot as independents. The statewide campaign for Nader and LaDuke inspired over 8,000 Mississippians to vote for them in November 2000. In fact, in that election Nader-LaDuke ran 3rd after the Bush and Gore tickets – 3rd of 8 choices for Mississippi voters. In the Jackson metro area, almost 1,200 people voted for Nader-LaDuke – 711 in Hinds County , 219 in Madison , and 261 in Rankin. They received 565 votes in Forrest and Lamar counties; 1,775 in the 3 Coast counties; 395 in Lafayette ; 240 in Lee; and 255 in Oktibbeha. The Green Party of Mississippi will affiliate with the Green Party of the United States , develop its state and local structures, and move toward nominating candidates who support the Green Party of Mississippi and its 10 Key Values. Those 10 Key Values – Ecological Wisdom, Social Justice, Grassroots Democracy, Nonviolence, Decentralization, Community Economics, Feminism, Respect for Diversity, Personal and Global Responsibility, and Future Focus – will be the basis for all Green Party activities. We invite every Mississippian to embrace those values and work for them through the Green Party. Now that the application to register the Green Party of Mississippi has been approved by the Secretary of State, we ask the more than 8,000 Nader-LaDuke voters and all other supporters of Green values to join the Green Party of Mississippi. We can be contacted at www.greenpartyms.org or c/o Greg Johnson, Treasurer, 1920 Brooklane Drive , Apt. A, Hattiesburg , MS 39401.